It's unrealistic to expect there won't be any children in attendance at your wedding. 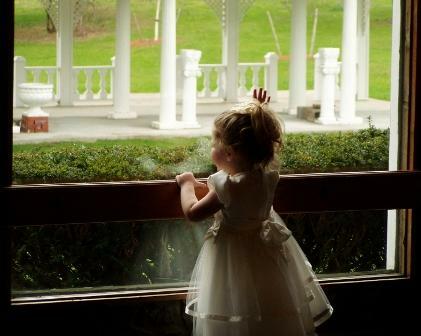 Every bridal couple should address concerns about children participating or attending their ceremony. Wedding etiquette offers several solutions to allay any related anxieties. Brides and grooms who have concerns about children at weddings aren't anti-child. They have planned this day meticulously for months, maybe even years. Children can be a bit of a wild card when it comes to social events, especially a lengthy, detailed wedding ceremony or at a late-night cocktail reception. While invitation etiquette rules say that you shouldn't be too blunt about your request, you can give some serious hints. Start by listing the parents name only on the inner and outer invitation envelope. Don't write "The Patrick Family." Do write "John and Mary Patrick." Additionally, you can make the RSVP card acceptance line read "Please reserve two seats for John and Mary Patrick" if you want to drop a not-so-subtle hint. The wedding has limited seating and is restricted to adults only. At the couple's request the wedding is for adults only. If you think that asking parents to leave children at home will create tension within your family or friend circle, consider hiring a babysitter if you have the budget. Many churches and reception halls have areas set aside for children. Parents won't have to leave their children at home and you won't have to worry about whether children might be disruptive. If you have no qualms about having children at the wedding, there are a few things to keep in mind, from ideas to including children in the wedding to keeping them entertained during the ceremony or reception. Young children may be bored. Supply coloring books, crayons and other activities that might keep them amused for a few hours. This is a good task to assign a bridesmaid or a reliable friend. Young children might not appreciate wedding food. Prepare for picky children and ask the catering company to offer substitute meals for children. Children get sleepy at long receptions. Request a few back to back slow songs to give parents a nudge to take kids home. You might even ask parents ahead of time to remove children by a certain time. Consider adding roles for children in your wedding. Besides flower girl and the ring bearer, kids can usher and distribute favors to guests. Ask the photographer to make a children's gallery of the kids in attendance. Whether or not children belong at a wedding depends on the couple. If you are the guest, you need to respect the bride and groom's wishes. Understand that if your child is not invited it is in no way an affront to you and your family. Couples often try to be fair, and they must invite all the children or none of the children; it isn't a reflection on your particular child. Instead, try and see the bride and groom's perspective. Some weddings are very involved and lengthy. Couples know that sitting still for a long period of time may be challenging for a child. Wedding receptions are fun affairs but some are meant for adults only. Late night cocktail receptions with appetizers like fig pizzas and free-flowing drinks are not typically appropriate for children. Keep in mind that the reception may not be fun for your children or yourself if they attend. Whether or not there should be kids at weddings is entirely up to the bride and groom. If they decide they would rather not invite children, please respect their wishes. Just as the couple has the choice on who to invite, the guests can choose whether or not to attend. Couples should understand when guests decline due to the no child policy, and guests should decline with no hard feelings if they feel they can't attend.